On 10/11 Chaitra, 2075 [March 24, 2019], National Examination Board (NEB) has published Exam Centers for Grade 11 (XI) and Grade 12 (XII) Exam. The examination of grade 12 will be conducted from 15 Baishakh, 2076 [April 28, 2019] and will end on 26 Baishakh, 2076 [May 9, 2019]. Grade 11 (XI) Exam will be conducted from 29 Baishakh, 2076 [May 12, 2019] and will end on 8 Jestha, 2076 [May 22, 2019]. The Examination time for Grade XI (11) & Grade XII (12) for the academic year 2075 B.S. will be started from the 7 am to 10 am MORNING. 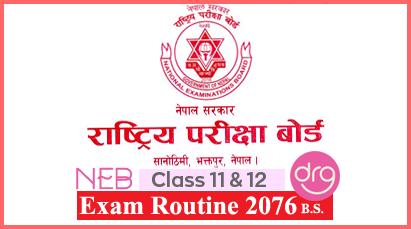 Check and Download PDF Routine of Grade 11 (XI) & 12 (XII) 2076/2019 National Examinations Board (NEB). All the information i.e. Downloadable links provided below are directly connected to the official website of National Examination Board NEB. Note: Inside BIRATNAGAR Exam Center :- Check Exam Centers of Class 11 and 12 for Taplejung, Panchthar, Ilam, Jhapa, Morang, Sunsari, Dhankuta, Tehrathum, Sankhuwasabha and Bhojpur districts. Note: Inside BUTWAL Exam Center :- Check Exam Centers of Class 11 and 12 for Gulmi, Baglung, Palpa, Nawalparasi, Rupandehi, Kapilbastu and Arghakhanchi district. Note: Inside DADELDHURA Exam Center :- Check Exam Centers of Class 11 and 12 for Bajura, Bajhang, Achham, Doti, Dadeldhura, Baitadi and Darchula districts. Note: Inside DANG Exam Center :- Check Exam Centers of Class 11 and 12 for Pyuthan, Rolpa, Western Rukum, Eastern Rukum, Salyan, and Dang districts. Note: Inside DHANGADHI Exam Center :- Check Exam Centers of Class 11 and 12 for Kailali and Kanchanpur districts. Note: Inside HETAUDA Exam Center :- Check Exam Centers of Class 11 and 12 for Makwanpur, Rautahat, Bara, Parsa and Chitwan districts . Note: Inside JANAKPUR Exam Center :- Check Exam Centers of Class 11 and 12 for Janakpur, Dhanusha, Jaleshwor - Mahottari, Sarlahi and Sindhuli districts. Note: Inside LAHAN Exam Center :- Check Exam Centers of Class 11 and 12 for Okhaldhunga, Diktel-Khotang, Udaypur, Saptari and Siraha districts. Note: Inside NEPALGUNJ Exam Center :- Check Exam Centers of Class 11 and 12 for Nepalgunj-Banke and Gulriya-Bardiya districts . Note: Inside OUT OF KATHMANDU VALLEY Exam Center :- Check Exam Centers of Class 11 and 12 for Solukhumbu, Ramechhap, Dolakha, Sindhupalchowk, Kabhrepalanchowk, Nuwakot, Rashuwa, Dhading and Okhaldhunga districts. Note: Inside KATHMANDU VALLEY Exam Centers :- Check Exam Centers of Class 11 and 12 for Kathmandu. Note: Inside POKHARA Exam Center :- Check Exam Centers of Class 11 and 12 for Gorkha, Lamjung, Tanahu, Syangja, Parbat, Gulmi, Kaski, Manang, Mustang, Mygdi and Baglung districts. Note: Inside BHAKTAPUR Exam Center :- Check Exam Centers of Class 11 and 12 for Bhaktapur. Note: Inside LALITPUR Exam Center :- Check Exam Centers of Class 11 and 12 for Lalitpur. Note: Inside SURKHET Exam Center :- Check Exam Centers of Class 11 and 12 for Surkhet, Dailekh, Jajarkot, Dolpa, Jumla, Kalikot, Mugu and Humla districts. 10 Responses to "Exam Centers Of Grade 11 & 12 | 2076/2019 | NEB"
where is the exam centre for Chitwan?? Please check HETAUDA Exam Center link for Chitwan. Where is the centre of Prasadi Academy Lalitpur...link you gave is not responding.Can you check it for me?